Chesterfield FC paid homage to a homegrown hero on Saturday as former player and Spireite legend Ernie Moss, was honoured by two of his former clubs at the Proact, in front of over 7,000 supporters, family and friends. Ernie, who is suffering from Pick's Disease - a rare and unforgiving type of dementia - attends every home game at the stadium, a place where, his daughter Nikki told us, he feels secure - and he was undoubtedly delighted to see his team triumph over Port Vale (another former club) on the day in a 3-0 win. The day belonged to Ernie though and with his wife, two daughters, their husbands and grandchildren, he can have been left in no doubt as to how much he means to the club and the people within it. It was also a day which his family were keen to see raise awareness and funds for the condition which affects their dad - who is physically fit and healthy. Once again, the football community rallied round one of their own - with Brampton Brewery producing an 'Ernie 8' ale, commemorative badges (commissioned by Club Director Ashley Carson) sold - and bucket collections being held around the ground. 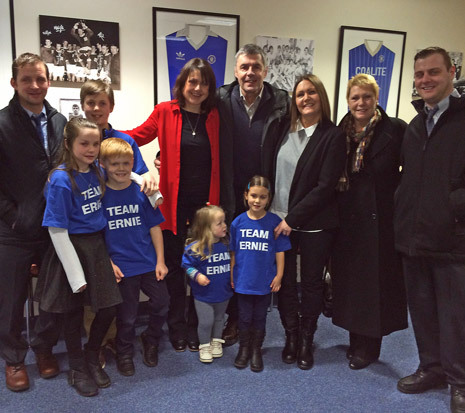 It was an emotional day as applause rang around all sides of the stadium on 8 minutes (Ernie wore the number 8 shirt) and again, as he and his family gathered on the pitch at half time, (his grandchildren wearing 'Team Ernie' T shirts) with former colleagues including Bob Newton, Sean O'Neill and Albert Holmes alongside him. 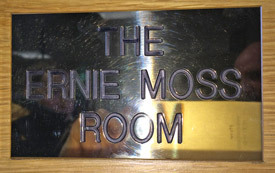 There was more recognition of past achievements - in the form of an 'Ernie Moss' room in the Hub - unveiled by Ernie and his family - and containing shirts and pictures of past glories (above). 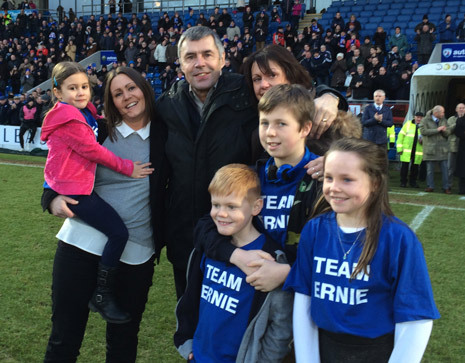 During the opening, Ernie's wife Jenny spoke to The Chesterfield Post and told of her pride and humility in the efforts of the club in recognising her husband, "He's Chesterfield through and through. We're all proud! 'Team Ernie' all the way! "We want to raise awareness. His illness is a different type of dementia, it's taken his speech and social skills but he is fit as a fiddle! There's no cure. I just wish he could appreciate today as much as we do!" Peter Whiteley, part of Chesterfield Community Trust and lifelong Spireite fan, said he too was honoured to be part of the day - and organising the room for Ernie - and told us how it all came about, "Some years ago, I asked Ernie if he'd lend the club his shirts but it didn't happen. What we've done is open this room with Ernie's three championship shirts in and his family have opened it today. There was a fan led applause on 8 minutes at the Sheffield United game and this game lent itself to this - to recognise his achievements before it's too late." Albert Holmes played with Ernie and had come to honour his team mate on Saturday. So what was Ernie like to work with? "As a player he had a great engine. He was a strong lad and you could always count on him for a goal or two. He's a good lad and I enjoyed playing with him." Everyone has memories of Ernie - and a story to tell - and the Moss family say they have drawn enormous comfort from those memories which have been shared on social media and to the family themselves. Alan Wilkinson, a Chesterfield fan of many years had contacted Ernie's daughter Nikki to share his thoughts on the day - telling Nikki how her dad was his "All-time favourite Spireite", describing him as "A true gentleman whose warmth and brilliant personality shone through". As a mark of his respect for that gentleman, Alan has agreed to become part of 'Team Ernie' as they take on the Chesterfield Marathon to raise further funds to help fight the cruel illness. 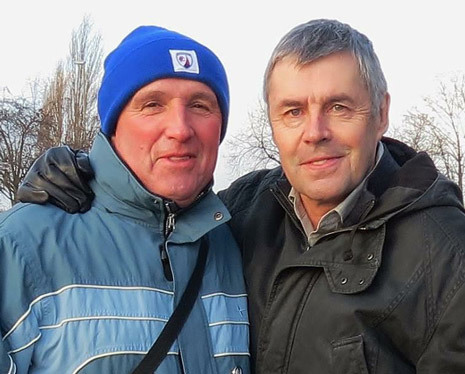 Another lifelong Spireite and massive Ernie Moss fan is Barry Dyke (pictured above with Ernie before Saturday's game), who recalls as an 11 year old, living close to Ernie, who would have been 18 at the time, in Hollingwood and Inkersall (Barry on Dovedale Avenue and Ernie on Madin Drive) and having a kickabout with him on the field at 'Inky', when Gerry Clarke, CFC's first team coach of the time, pulled up and got out of his car to say to Ernie, "You're a professional now, you can't play with the kids anymore lad!" Another heart-warming tale that goes to show that Ernie is a true Chesterfield lad and should be kept close to the club and the town's hearts - and please, carry on supporting 'Team Ernie'! After seeing his side progress to the FA Cup 4th round for the first time in two decades, Chesterfield Assistant Manager Leam Richardson told us, "On reflection, we deserved the win!" Spireites Asst Manager Leam Richardson previews Tuesday night's FA Cup third round clash at Scunthorpe United, with the prospect of a visit to Derby County in the 4th Round while CEO Chris Turner updates us on transfer speculation. After making it two wins in two over the festive period, Chesterfield travel to Coventry's Ricoh Arena today, hoping to pick up the last three points of 2014. 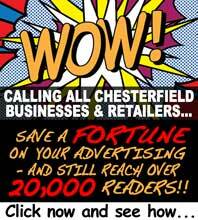 With his team sitting 11th In League One, Chesterfield CEO Chris Turner admits that, though results haven't gone their way the last few games, overall he is satisfied with the start made by the newly promoted club. SPIREITES COMMUNITY TRUST NEWS - HALLOWEEN TREATS! THE PAUL COOK INTERVIEW - "NO-ONE WANTS TO WIN MORE THAN ME!" It's back on the road for the Spireites this weekend with preparation for a trip to Port Vale tomorrow well under way. It's been a long closed season, with the usual high level of speculation and rumour, but today Chesterfield FC unveiled the squad that will lead into the 2014-15 campaign, which begins at Leyton Orient on Saturday. Disappointment throughout the Spireites fan base with the release of Chairman Dave Allen's statement confirming that the budget had been 'trimmed' and no new signings were imminent. Chesterfield's academy has retained its category 3 status and is now appealing for local businesses and organisations to share in its success. Chesterfield midfielder Sam Morsy has signed a contract extension following an impressive first season at the club which saw him win the Player of the Year award. After the heartbreak of losing at Wembley, Chesterfield now have just 6 matches of the campaign left to gain promotion to League One. It's the biggest of derby games for Chesterfield this weekend as they travel to Field Mill to take on Paul Cox's Mansfield. SPIREITES MAKE A POINT AGAINST THE DONS. It was a philosophical Paul Cook who faced the media on Monday morning - less than 48 hours after his side slumped to a 3-1 defeat at his former club, Accrington Stanley. With just 14 League games to go until the end of the season, tests are coming thick and fast for the Spireites, with midweek matches scheduled for the foreseeable future. Winger Gary Roberts has warned his Chesterfield team-mates the job is "only half-done" as they aim to complete their Wembley mission against Fleetwood Town.